Sometimes its easy to take for granted that every customer coming your way knows all about the Internet. In reality, this is hardly the case. Your average person doesn’t know what bandwidth is or why they need it, what cPanel is, or even how to compose an email. We’re going to take a step back here and approach our hosting plans like your first time user would. What is shared hosting, and who should use it? If you’re starting your first website, shared hosting is for you. Its cheap, easy to use, and provides everything you need and nothing you don’t. On a shared hosting plan, you’re in a hosting environment with other people, hence the term ‘shared’. Each user has a set amount of resources (bandwidth, disk space, CPU, etc..more on this in a bit) and even if they exceed their limits, it doesn’t impact you. We also have software in place to truly keep you in your own environment, but that is a bit outside the scope of this post. As you can see from this screenshot, control of your hosting account is right at your fingertips. On the left side you can see your home directory, CPU usage, disk space, bandwidth, and then if you expand the stats a lot more becomes available to you. Additionally, the options shown under ‘Hawk Host Links’ and ‘Preferences’ are just a small percentage of what you can do. For anyone getting started with webhosting, a shared hosting plan with cPanel is your best bet. Bandwidth: In simplest terms, bandwidth is the amount of data your site can transfer over the course of a month. The more monthly bandwidth you have the more visitors your site can have. Anytime someone visits your site, it takes bandwidth to ‘serve’ their request. Disk Space: Similar to the hard drive on your local computer, disk space is the amount of total storage space you have on your plan. If you have a 3GB space limit, and upload 1GB of photos, you’ll have 2GB remaining. CPU Limit: When you have people visiting your website, in addition to the bandwidth they use, they’ll also consume a small portion of CPU. Unless you have a very busy website, you’ll probably never reach your CPU limit. If you do, we have tools available in cPanel to help show you why. Addon Domains: When you setup an account, you provide us with your primary website. You can also add additional domains to the account, each with their own unique content. As long as you have enough bandwidth, disk space, and CPU, you can host as many websites with us as you want. DNS: DNS is what helps the rest of the Internet know how to access your site. 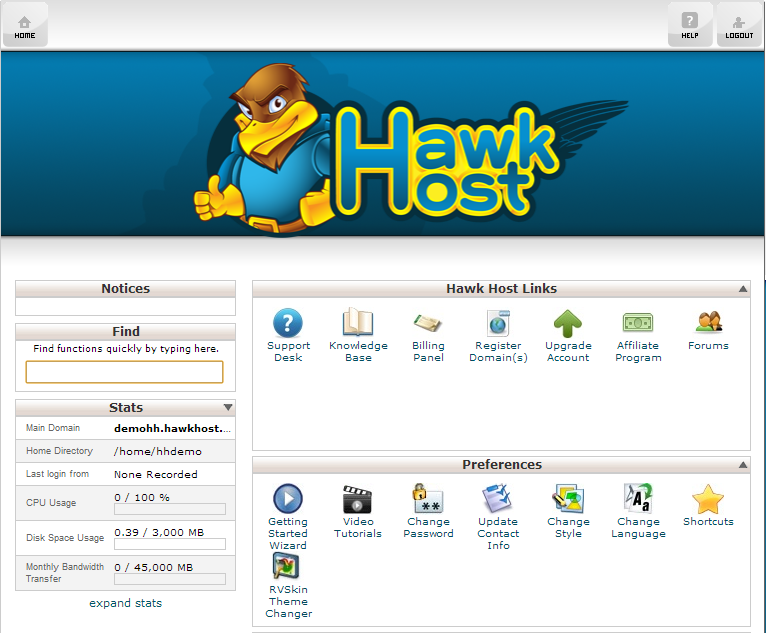 When you setup an account, you’re provided two nameservers (For example, ns1.hawkhost.com and ns2.hawkhost.com). Once you change your website(s) to use those nameservers, we then host your website and control your DNS. DNS is what helps determine your sites IP, where your email is hosted, and much more. Now that we have the basic terms down and an idea of what shared hosting is, we’ll cover reseller hosting. What is reseller hosting, and who should use it? Reseller hosting is similar to shared hosting in a lot of ways. You’re still given a web based control panel (cPanel), you still setup email accounts and manage your resources the same way, and you’re still on servers with other people. So what is the big difference? 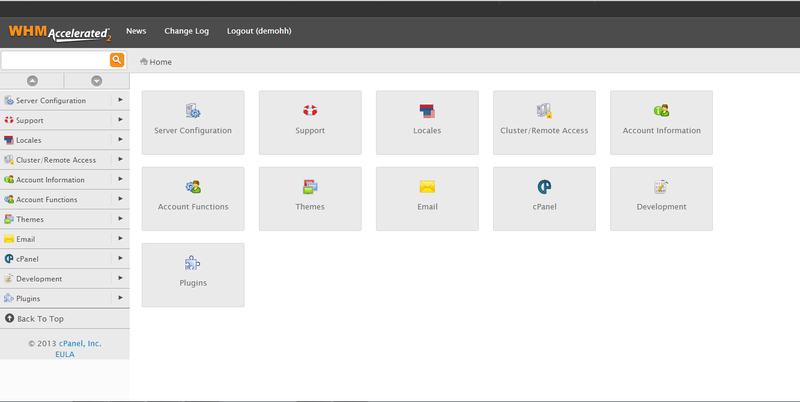 The first thing you’ll notice, compared to our cPanel interface, is that WHM is entirely unbranded. We provide a true whitelabel reseller service. What this means is if you chose to sell webhosting to friends, customers, associates, etc, they wouldn’t know you were using us as a provider. In addition to an unbranded WHM, we also provide anonymous nameservers, so even DNS lookups won’t reveal you’re hosting with us. So what benefits come from reseller hosting? For starters, instead of having to use the ‘Addon Domain’ option like you would in cPanel for shared hosting, you can create entirely separate cPanel accounts for each website you wish to host. A major benefit of separate cPanel accounts for each website is they won’t share certain resources, such as email limits, CPU usage, concurrent processes, etc. This greatly reduces the risk of one addon domain limiting the rest of the sites hosted on a single cPanel account. This means a unique domain, login details, content, and complete isolation from your other websites. If you’re looking to sell webhosting, or you’re a designer providing hosting for a number of clients, reseller hosting is for you. You can also create your own custom, branded cPanel themes and configure your own disk space/bandwidth limits for the cPanel accounts you create. WHM also allows you to have a central login to each of your cPanel accounts, making it easy to manage your websites without needing to store each individual cPanel login. What is semi-dedicated hosting, and who should use it? CPU Limits: In shared hosting you’re given access to 1 CPU. All semi-dedicated plans get access to 2 CPUs, providing a higher threshold for your busier/resource heavy sites. Email Limits: Our shared plans allow you to send 1,000 emails per hour. For most folks that is more than enough, but for those of you with a lot of customers to reach or some highly subscribed newsletters, those extra 1,000 emails per hour may make the difference. Hardware: While we’re working on moving all of our servers to this setup, our semi-dedicated servers include solid state hard drives (SSDs) for improved caching and performance. Anyone who relies on MySQL heavily will see a noticeable improvement on an SD plan. Backups and data protection: Your data is backed up twice per day and retained for 7 days. Even if you make a mistake, we can easily revert your site and get you back online. If you’re a new user and looking to jump straight to semi-dedicated plans, I suggest reading the section above about shared hosting first. 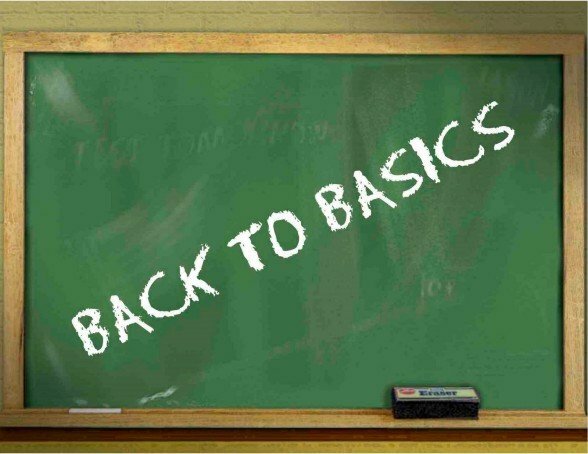 It covers all the basics so you know the lingo before you need the benefits of an SD plan. How do you know you’ll need semi-dedicated hosting? For starters, if you’re hitting a CPU limit in shared hosting it may be time to upgrade. Outside that, if you’re running a site that is PHP/MySQL based (any forums, WordPress, Joomla, etc) or if you absolutely cannot afford slowdowns on your site, you’ll find the benefits of a semi-dedicated plan right up your alley. What is VPS hosting, and who should use it? VPS stands for “Virtual Private Server”. A VPS is your own server, not shared with anyone else, and you’re 100% in charge of the environment, configuration, and management. Need to install software that isn’t available on our other plans? Does your application or script require more memory and CPU than a shared plan allows? A VPS is for you. When you order a VPS, you’re given a base installation of the operating system you choose. You’re given full root (administrator) access, and we don’t restrict what you install or how you configure the VPS. You can use it as a dedicated mail server, setup a webhosting environment, or even run a Minecraft server. The choice truly is yours to make. In most cases, anyone ordering a VPS also purchases cPanel/WHM along with it. WHM, when you have full root access (unlike reseller hosting where you only have limited access), helps you manage, install, maintain, upgrade, and configure all the necessary software to host a website. This includes your webserver (Apache, Litespeed, nginx, etc), DNS server (bind, MyDNS, NSD), database server (MySQL, PostgreSQL), FTP server (pure-ftp, ProFTP) and a myriad of other services. While administering your own server is not easy, especially if you’re just getting started, WHM makes it as simple as possible. There are alternatives to WHM, but we find it to the best option for anyone who is managing their own server for the first time. In addition to your web control panel, all VPS plans with us include access to our own custom, in house VPS panel. This panel provides you a resource overview (disk space, bandwidth, memory usage), allows you to easily change your VPS hostname and root password, and lets you start/stop/restart your VPS as needed. If you’re looking to setup or upgrade to a VPS, odds are you’re not new to the hosting industry and a lot of what we’ve covered is a second language to you. If you’re not, and a VPS sounds better to get started with, there is no shortage of documentation and help available on Google. What other resources are available for a first timer like me? WebHostingTalk – WebHostingTalk (WHT for short) is easily the most popular and reputable hosting discussion forum around. Topics range from shared, reseller, and VPS hosting all the way up to colocation and security. cPanel User Guide – Expanding more on what we covered earlier about cPanel, this is the official userguide straight from the developers themselves. If you’re not sure how to do something, this guide will walk you through. WHM User Guide – While this guide is only useful for VPS users primarily (most of it needs root access), you may still find some tips and tricks in here to help coast through your hosting setup. Hawk Host KnowledgeBase – A lot of the information contained in our KB is specific to our services, which if you’re a user of ours should be very helpful! We also have our 24/7/365 support available through helpdesk and email to provide a hand if the KB doesn’t do it. These are just a few of the many resources on the web to turn any rookie into a professional webmaster in no time. A carefully crafted Google search, including any errors you’re getting or your specific question, should turn up an answer in no time. With a little bit of patience and some legwork to start, you can have a successful website up in no time. This entry was posted in General and tagged PHP 5.5, reseller hosting, semi-dedicated hosting, shared webhosting, VPS hosting. Bookmark the permalink. I have tried many Web hosts, but usually end up disappointed. I used to think that the only way to speed up my WordPress site was to run at least a VPS, but the Semi dedicated plan is really zippy. Great job on adding Php 5.5. Thanks for the refresher course! How about ram limits for semi-dedicated? Wow thanks for describing this simple way.. It was so confusing to choose which type of hosting package. I will surely go for dedicated hosting next year. I’am still confused for personal use, choose semi dedicated or reseller hosting? If you’re looking to host many web sites and want complete separation a reseller account is a great option. If you’re looking to host just a few high traffic web sites then a semi dedicated would be better. Best way to find the right hosting company I think is their customer service as well as fair pricing. That’s what everyone should look for. Sometimes good customer care comes at a little bit higher price for hosting. I always prefer better customer care over price due to the nature of my businesses.